By now, many of you have heard about the October 17 attack by Royal Canadian Mounted Police on the Mi’kmaq Warrior encampment near Rexton, New Brunswick, Canada. About 200 Mounties descended on an anti-shale gas encampment with assault rifles and dogs to issue an injunction against their protest, arresting around 40 people, including Elsipogtog First Nation Arren James Sock, in the process. This marks yet another incident in the cycle of boiling antagonisms between grassroots First Nations people and the Harper government and corporations over issues of sovereignty and ecology, as evidenced last year in Idle No More (see this summary and an interview with Idle No More activists here). 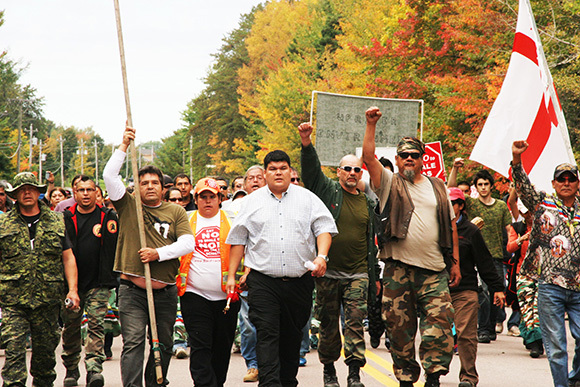 The Elsipogtog First Nation is a band government of Mi’kmaq (Mi’kmaw) in New Brunswick. The First Nations land includes Richibucto Reserve #15, Soegao Reserve #35, and adjoining lands held by the Crown in trust. Over a year ago, Mi’kmaq Warrior Society called for a halt to oil and gas exploration and to protect the water at Lake Ainslie. 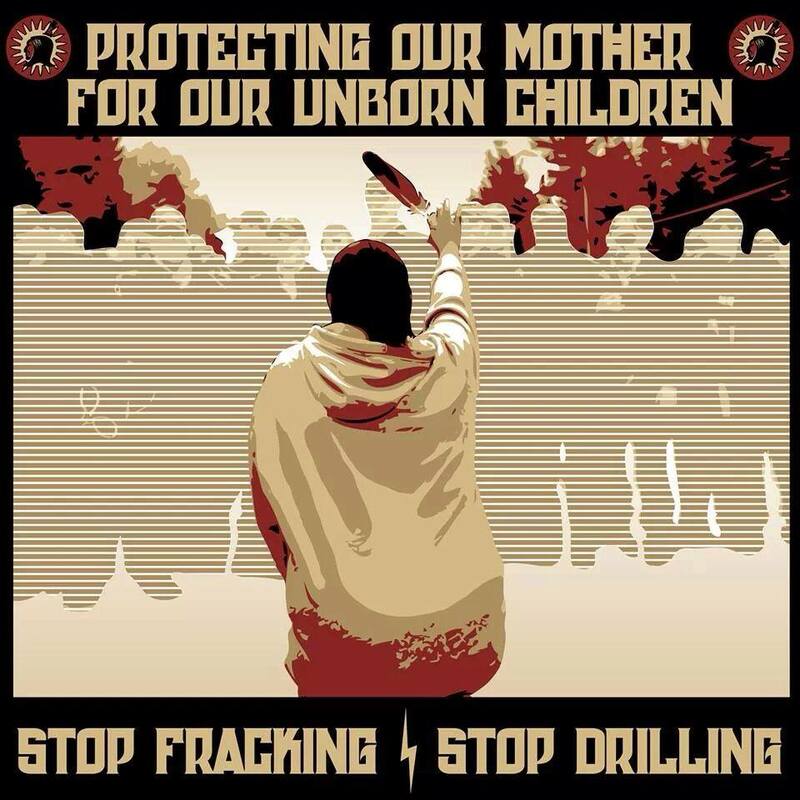 In fact, hyrdraulic fracturing (“fracking”) has been a key issue throughout Mi’kmaq Country. Photo by Miles Howe, Halifax Media Coop. Following the attacks on protestors by mounties, solidarity rallies and events began almost immediately and will continue throughout the weekend, happening south of the colonial border in the United States as well. The Nez Perce tribe came out immediately in support for the Elsipogtog. The uprising in New Brunswick shows us that the fire of Idle No More has not gone out (interestingly, Elsipogtog (L’sipuktuk) means “River of Fire” in the Mi’kmaq language). The Elsipogtog demand respect for their sovereignty, including that corporations and the provincial and Canadian governments acknowledge their rights over Crown Lands held in trust (including the land where the encampment was located) and show respect for the earth, including protection of lands, waters, and natural resources, as expressed in treaties. The underlying growing corporate power in an age of austerity means that the Canadian state will not address other underlying issues and continuing injustices unless it is forced to do so. First Nations people have expressed not only frustration about the violations of their treaty rights and destruction of the earth, but also the need for adequate housing, educations, food, water, adequate and respectful child and family services, and the need to end violence against First Nations women both on and off-reserve. More of the same from corporations and the Harper government will mean that First Nations warrior societies will only continue to grow and resist–and it’s critical that they get all the support we can lend. Mi’kmaq Band Council is urging it members to reclaim all Crown land in the midst of the shale gas dispute in New Brunswick. It plans to hold a “reclamation day” on Saturday. “We will become steward of the land,” a resolution issued on Wednesday states. “Whereas we have lost all confidence in governments for the safekeeping of our lands held in trust by the British Crown; and whereas a notice of eviction from our Keptin has been totally ignored by the provincial government and Southwestern Energy (SWN Resources),” which was conducting seismic testing for shale gas near Rexton. ​”Today we have instructed all our people to go out and stake their claims for land they intend to occupy,” it states. People of Elsipogtog have received a form in the mail, asking them to sign up to become stewards, the resolution states.